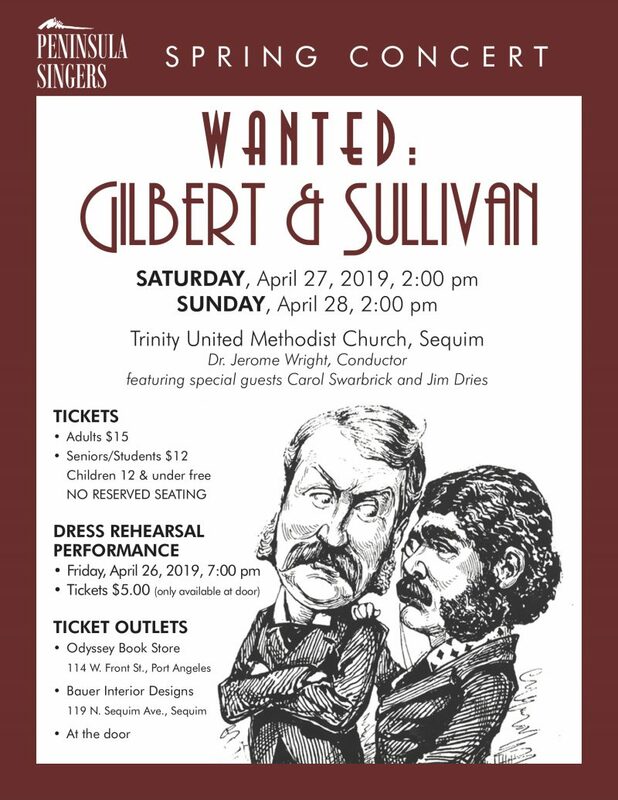 Our April Concert is 'Wanted: Gilbert & Sullivan'! Trinity United Methodist Church April 27th and 28th at 2 PM. Open Dress Rehearsal, April 26th, at 7 PM. Choral Music on Washington’s Olympic Peninsula! Fall, 2017. Click for larger larger image. Our membership is comprised of singers from Washington’s Olympic Peninsula. Since 1988, Peninsula Singers has been performing choral music to enrich and promote artistic excellence. We are musicians, engineers, teachers, doctors, nurses, business owners, managers, executives and retirees. Some have been professional singers, some degreed musicians, but we all sing for the pleasure of making great music. We strive to perform a variety of classical, folk art, gospel works and musical theater; and provide those trained in choral singing an opportunity for lifelong musical involvement.